Animal Behavior covers the broad sweep of animal behavior from its neurological underpinnings to the importance of behavior in conservation. 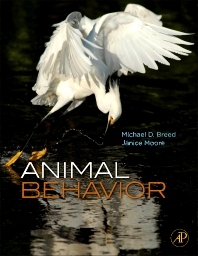 The authors, Michael D. Breed and Janice Moore, bring almost 60 years of combined experience as university professors to this textbook, much of that teaching animal behavior. An entire chapter is devoted to the vibrant new field of behavior and conservation, including topics such as social behavior and the relationship between parasites, pathogens, and behavior. Thoughtful coverage has also been given to foraging behavior, mating and parenting behavior, anti-predator behavior and learning. This text addresses the physiological foundations of behavior in a way that is both accessible and inviting. Each chapter begins with learning objectives and concludes with thought-provoking questions. Additionally, special terms and definitions are highlighted throughout. The book provides a rich resource for students (and professors) from a wide range of life science disciplines. 6.1 Introduction: What Is Cognition? 6.8 Are Cognitive Abilities Under- or Over-Attributed to Animals?